NEW: Israeli official: Strikes to continue "until we have a change on the ground"
U.N. Security Council urges "immediate halt to all violence"
GAZA CITY (CNN) -- The death toll from a weekend of Israeli airstrikes on Gaza has topped 300, Palestinian medical sources said Monday as a third day of air raids hit the Hamas-ruled territory. 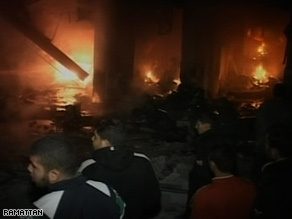 Fires rage overnight in Gaza, where Israel has been bombing what it says are Hamas targets. Another 650-plus people have been wounded in the strikes, the sources said. The U.N. Security Council has called for an immediate end to the airstrikes, which began Saturday. But Israel says its objective is to stop an ongoing stream of rockets fired by Hamas militants into southern Israel, and Prime Minister Ehud Olmert told Cabinet ministers Sunday that the situation "is liable to continue for some time." Palestinian security and medical sources said airstrikes hit the Jebaliya refugee camp in Gaza early Monday, and a home near Hamas leader Ismail Haniya's residence was hit overnight. Hamas security sources said that raid targeted the home of a senior leader in the group's military wing. The Jebaliya raid left five children dead in a home that was damaged when a nearby mosque was targeted, said Dr. Mu'awiya Hassanein. The Israeli military had no immediate comment on that claim. And a few minutes after midnight, an Israeli F-16 fired rockets into at least one building at the Islamic University of Gaza, a Gaza-based journalist at the scene -- whose name was withheld for security reasons -- told CNN. There were no immediate reports of casualties from that strike, which the IDF said targeted "a center for weapon research and development." "There was a loud series of explosions ... the entire apartment I'm in was shaking," said Sami Abdel-Shafi, a Palestinian business consultant in Gaza City. "It was scary and a very disappointing position to be in for the 'nth' time." "One of the structures struck housed explosives laboratories that were an inseparable part of Hamas' research and development program, as well as places that served as storage facilities for the organization," the IDF statement said. "The development of these weapons took place under the auspices of senior lecturers who are activists in Hamas. Among the weapons that have been developed and manufactured at this site are Qassam rockets." There was no immediate response from Hamas to the IDF statement.